If God is no respecter of persons, why are we? Am sitting at the car dealer having some work done, so I thought I would share a question. Think about it. the Bible tells us that we are all in the same boat coming into this world – lost sinners, every one. Yet we treat some who profess Christ different than others. Celebrities of all sorts who one day profess that they met Christ are instant ‘heroes’ of the faith and are put on pedestals. We might pray that they would connect with a Bible believing church or grow strong in their new found faith, but many times we just get all excited that so-and-so found Jesus and shout about it all over the place, as if their proclaiming Christ is somehow more special than all the normal average folks that God saves on a regular basis. A long time ago, in a land far, far away, I began a series on whom the faithful Christian minister may legitimately partner with in ministry. First, I briefly surveyed the history of the ecumenical movement in order to vividly illustrate the terrible consequence of disobedience to Scripture on this matter. Then, I oriented us to the key text that answers this question, 2 Corinthians 6:14-7:1, and considered the context in which it comes. Next, I considered the main prohibition of text itself, and explored what it means for Christians to not be “unequally yoked” with unbelievers. There is an absolute incompatibility between God and idols. And that is because all false religion is demonic. In 1 Corinthians, Paul has taught us that idols don’t really exist: “We know that there is no such thing as an idol in the world, and that there is no God but one” (1 Cor 8:4); “What do I mean then? That a thing sacrificed to idols is anything, or that an idol is anything? 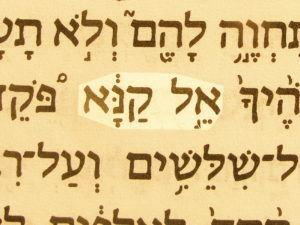 No!” (1 Cor 10:19). Idols are no true gods, because there’s only one true God: Yahweh, the Triune God of Scripture. “But,” he goes on, “the things which the Gentiles sacrifice, they sacrifice to demons and not to God” (1 Cor 10:20). The fact that idols don’t exist doesn’t mean that there is no spiritual component to idolatry. Scripture says the millions of false gods of the thousands of false religions in the world are actually demons. When Israel turned from the worship of Yahweh and committed idolatry by making sacrifices to the gods of the nations, Scripture says they sacrificed to demons: “They sacrificed to demons who were not God, to gods whom they have not known, new gods who came lately, whom your fathers did not dread” (Deut 32:17). And so Paul warns of those professing Christians who will abandon the faith and embrace false religion, saying, “The Spirit explicitly says that in later times some will fall away from the faith, paying attention to deceitful spirits and doctrines of demons” (1 Tim 4:1). This means that every false religion in the world is not just wrong; it is demonic. Every made-up idol—every false god of every false religion—isn’t just not true; it is a demon. It is energized and powered by the kingdom of darkness that is ruled by Satan himself. And so there simply cannot be any agreement between the worship of these demons and the worship of the one true and living God. That’s why, from the very beginning of Israel’s history, God speaks so severely about idolatry. The first two of the Ten Commandments are devoted to this: “You shall have no other gods before Me. You shall not make for yourself an idol, or any likeness of what is in heaven above or on the earth beneath or in the water under the earth. You shall not worship them or serve them; for I, Yahweh your God, am a jealous God” (Exod 20:3–5). And to the second generation Moses says, “You shall not follow other gods, any of the gods of the peoples who surround you, for Yahweh your God in the midst of you is a jealous God; otherwise the anger of Yahweh your God will be kindled against you, and He will wipe you off the face of the earth” (Deut 6:14). God is jealous for His own glory. He will not share the worship that He rightly deserves with demons! “I am Yahweh, that is My name; I will not give My glory to another, nor My praise to graven images” (Isa 42:8). How serious is God about there being no possibility of agreement between the temple of God and idols? Consider a couple of examples with me. Second Kings 21 chronicles the wickedness of King Manasseh, who is perhaps the most evil king in Judah’s history. And his wickedness consisted chiefly in his idolatry. Verse 3 says, “He rebuilt the high places which Hezekiah his father had destroyed; and he erected altars for Baal and made an Asherah, as Ahab king of Israel had done, and worshiped all the host of heaven and served them.” This is high-handed idolatry perpetrated by the king of Israel. But it gets worse. Verse 4 says, “He built altars in the house of Yahweh, of which Yahweh had said, ‘In Jerusalem I will put My name.’” And verse 7: “Then he set the carved image of the Asherah that he had made, in the house of which Yahweh said to David and to his son Solomon, ‘In this house and in Jerusalem, which I have chosen from all the tribes of Israel, I will put My name forever.’” In 1 Kings 8, when the temple is finally completed under Solomon, the cloud of God’s glory had filled the temple, declaring to the people that Yahweh would take up residence with them and dwell among them in His temple. Solomon calls the temple “the place of which You have said, ‘My name shall be there’” (1 Kgs 8:29). This is where God’s special presence dwells with His people. This is where His holy name dwells. And in the courts of that holy place, Manasseh builds altars to Baal, and to the sun and the stars. He brings a wood carving of Asherah into the very temple of Yahweh. “I will abandon the remnant of My inheritance.” That ought to make every last one of us tremble. There is no greater insult, no greater blasphemy, than to bring idols of demons into the holy temple of God, and, in adulterous fashion, worship them rather than Him as it were right in front of His face. We need to feel the weight of that. So that God would be far from His own sanctuary? So that He would be absent from the very place that was designed to house His special presence with His people? This is unthinkable. “But,” verse 6, God says, “you will see still greater abominations.” God tells Ezekiel to dig through a hole in the wall to see what was going on in there. Verse 10: “So I entered and looked, and behold, every form of creeping things and beasts and detestable things, with all the idols of the house of Israel, were carved on the wall all around. Standing in front of them were seventy elders of the house of Israel, . . . each man with his censer in his hand and the fragrance of the cloud of incense rising.” The elders of Israel—the spiritual leaders of God’s people—were worshiping the images of idols that they had carved on the wall of Yahweh’s temple! “But,” God says again, “You will see still greater abominations” (Ezek 8:13). And then he sees women weeping for the Babylonian god Tammuz (Ezek 8:14). And then he finds twenty-five men with their backs to the temple of Yahweh and their faces toward the east, bowing and worshiping the sun (Ezek 8:16). How symbolic that these men have turned their backs upon Yahweh’s temple. These abominations, this mass idolatry, is happening in the temple of God. In the place where His glory dwells! In the place where He condescends and meets Israel and provides atonement for their sin! So once again: what is God’s response? Verse 18: “Therefore, I indeed will deal in wrath. My eye will have no pity nor will I spare; and though they cry in My ears with a loud voice, yet I will not listen to them.” And then Ezekiel sees God send executioners into the city to destroy all those who have committed idolatry. God commands them: “Utterly slay old men, young men, maidens, little children, and women, . . . and you shall start from My sanctuary” (Ezek 9:6). Judgment begins with the household of God (1 Pet 4:17). But then, even worse than that, the shekinah glory of God, which symbolizes God’s presence with His people, starts to stir. In 10:4 it moves from the ark of the covenant to the entrance of the temple. And then in 10:18–19 the glory stands over the angels of Ezekiel’s vision, who then move to the east gate of the temple. And then, finally, in 11:23, the glory of God departs from His temple, and stands over the Mount of Olives, before ascending into heaven. For the first time in the 850 years of Israel’s history, the people of God are without the presence of God. Yahweh is no longer dwelling with His people. “What agreement has the temple of God with idols?” What happens when you try to yoke believers together with unbelievers? What happens when you try to mix demonic false religion with the worship of the one true God? What happens to a church that tries to make common spiritual cause with and partner in ministry with those who are not genuine believers in Christ? 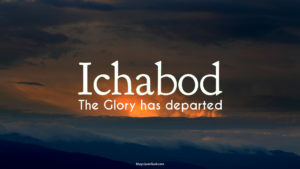 God writes Ichabod over the doorpost of that church. The glory of God’s presence departs from that place. Dear readers, do not be unequally yoked with unbelievers, for what agreement has the temple of God with idols? You say, “Now wait a minute. I can see how all this ‘temple’ talk relates to Israel. But what does that have to do with the church?” 2 Corinthians 6:16: “For we are the temple of the living God!” In this age, the spiritual body of Christ, the Church, is the temple of God—the place where the glory of His presence dwells. God no longer dwells merely with us, in a sanctuary or a building that we construct for Him. He dwells in us, in hearts that He has recreated for Himself, and we ourselves become His temple. What, then, is the consequence? What responsibility does that create for us? Verse 17: “Therefore, ‘come out from their midst and be separate,’ says the Lord. ‘And do not touch what is unclean.’” If it was unthinkable—the height of blasphemy—for a temple made of wood and stone to have any association with idols, how much more unthinkable—how much more blasphemous—is it to bring idols into the temple which is constructed with living stones (cf. 1 Pet 2:5)? If God brought such destruction and judgment upon Israel for desecrating His temple with idolatry—if He delivered them over to death and to exile, if He removed the glory of His presence from their midst, and destroyed the very temple where He had caused His Name to dwell—how much severer should His punishment be for those who unite the living temple of God with idols? And yet that is what we do when, in “ecumenical” fashion, we propose to unite in common spiritual cause or ministerial partnership with the enemies of the Gospel. It doesn’t matter how many social issues or political positions we agree on. It doesn’t matter if they call themselves Christians and say they love and worship Jesus. If they do not confess faith in the only true and saving Gospel, they do not worship God in Christ, but a false god, an idol whom they’ve fashioned in their image, and thus they share in the worship of demons. The dear people ensnared by these idolatrous false religions are not our partners in ministry, but our mission field. They need the Gospel. They do not need to be inoculated against the Gospel by being led to believe that they are genuine partners in ministry with the true people of God. We need to come out from them and be separate. Not so that we can shun them and feel superior about ourselves. But so that the fundamental differences between us might be made plain, that their need for faith in the true Gospel of the true Jesus might be made clear, and so that we can bring them that message of Good News in its purity. I have long been puzzled by the demonstrated vitriol of many who rave and rant against John Calvin and Calvinism. These folks don’t just disagree with what is probably better defined as sovereign grace doctrine, they absolutely HATE it, blaming everything the hate about it at the fate of John Calvin, as if he invented the idea of sovereign grace and personally originated the much despised TULIP acronym, an idea proven completely false by any honest historian. I won’t get into the ‘poisonous flower’ (according to non-Calvinists) here; that’s a story unto itself. It’s the abject hatred to which I refer. By now, I’ve managed to gather a rather large amount of the above mentioned vitriol, but I won’t get into the sordid details. Like I intimated, my question is “WHY such hatred?” In all of the documents I have assembled thus far, I haven’t found what I think might be the core issue, although I probably just haven’t found what is undoubtedly out there – somewhere. You see, I’ve come to the conclusion, right or wrong, that the reason for all the hatred and vitriol against Calvinism is what I call the ‘assumption of libertarian free will’ that has become so ingrained in so much of today’s Protestant evangelicalism, that considering the opposite (the fallen human will cannot, nor will not ever choose Christ). For the sake of argument, assume for a moment that my conclusion is correct. Now we must face the question of “WHY won’t so many even consider the possibility that the human will of fallen man might be incapable of choosing Christ?” After all, scripture seems very clear about such things. Take Romans 3:9-11, Romans 8:5-8, or 1 Corinthians 2:14 just for starters. If you want to go deeper into it just do an internet search on ‘the nature of fallen man’. I cannot fathom why anyone could read any of those passages and not wonder if the belief in complete natural free will is really true! Back to my WHY question. “WHY won’t so many even consider the possibility that the human will of fallen man might be incapable of choosing Christ?” The simple answer is that they just don’t want to. But again, “WHY not?” Here’s where I make some people really mad. I think it’s a simple case of ‘idolatry’. You see, we hate it when that which we ‘worship’ is attacked or shown to be wrong or false. False idols don’t go down easy. We humans are a stubborn lot. And when one does come crashing down, we tend to find another, at least until God opens our eyes to our idolatry. The ‘free will’ idol might just be the toughest and most firmly entrenched false God of American Christendom. To consider something is to examine every side and use the information obtained from reputable sources and only then come to conclusions. It’s a call to rational thinking, nothing more. My prayers are also to that end. I used to be ‘Ed’ a long time ago, but at some point I began serious study of the Bible and the history of John Calvin and Calvinism. But like I said, false idols go down hard! Let’s talk about decorated trees and nativity scenes for a minute. Forget the Christmas ‘culture’ wars that we sometimes make too much of, what about the Christmas ‘pagan roots’ wars? OK, maybe calling the whole ‘Christmas is based on a pagan holiday’ thing doesn’t deserve ‘war’ status, but it does surface every year about this time. Like many children I grew up with Christmas trees, nativity scenes and traditions of gift giving. For our family everything ‘Christmas’ focused first and foremost on the birth of Jesus Christ, the savior of the world. I knew absolutely nothing about ancient pagan idolatrous practices, festivals or holidays. It was about Jesus’ birth, love and exchanging gifts. Are Christmas trees and nativity scenes examples of ‘Christianized’ pagan idolatrous activity? I really don’t know. Was Martin Luther thinking of old Egyptian and Roman traditions associated with false gods when he thought of adding decorations to evergreen trees already used by Christians as a symbol of Christmas? I don’t know that either. Were the painters of nativity scenes thinking about pagan idol worshippers dancing around statues in the woods, or were they thinking about the description of Jesus’ birth given to us in the Bible and wanted to use their God given talents to put on canvas a remembrance of a special moment in history? I don’t know that either. Well Dan, what DO you know? “1Now concerning food offered to idols: we know that “all of us possess knowledge.” This “knowledge” puffs up, but love builds up. 2 If anyone imagines that he knows something, he does not yet know as he ought to know. 3 But if anyone loves God, he is known by God. 4 Therefore, as to the eating of food offered to idols, we know that “an idol has no real existence,” and that “there is no God but one.” 5 For although there may be so-called gods in heaven or on earth—as indeed there are many “gods” and many “lords”— 6 yet for us there is one God, the Father, from whom are all things and for whom we exist, and one Lord, Jesus Christ, through whom are all things and through whom we exist. There are ‘stronger’ and ‘weaker’ believers. Those who know that idols are really ‘nothing’ are not to get puffed up about it, and are not to cause a ‘weaker’ brother to stumble. In Romans 14, Paul said that it is better not to do anything to cause another brother to stumble. It seems that the real issue here is spiritual growth and health. That’s what I know. If I want to get into a ‘pagan roots’ discussion that might actually matter, it might be about something like ‘glossolalia’, or the ‘speaking in tongues’ that is not the Biblical gift of speaking in unlearned real languages. There’s some really interesting history in that one! But actually, rather than debate ‘pagan roots’, I think it might be more helpful to take a cue from Paul and stick to discussing Christ crucified for our sins. The Spirit of Idolatry is a subtle lure. In some ages, men bow to Dagon and Baal and in others it is Abstract Freedom and Empirical Knowledge. Placing any forbidden obsession at the apex of human consciousness and desire causes an ontological distortion in the perceiving eye and its corresponding soul — projecting into infinity our dilemma of unrequited thirst for completion, for the substance which the world cannot of itself give to us. No temporal peace or earthly rapture — no golden calf forged in the cauldron of our longing could ever prove sufficient to quell the mystery of our incessant quest for the union of all things — the absence of which condemns us to carnal bleakness and confines us to the velvet-lined misery of incommunicable despair. As we wrestle at night in the desolation of solitary thoughts, that droning din of meaninglessness that runs across our soul like a saw blade bears witness to the Spirit of Idolatry — a Cassandra warning for us against the barren antipode we have sought refuge in. Those deaf and sterile gods we are enthralled in stark fealty to will not answer us in that hour of excruciating need. They have always fallen, and they are falling even now as still-born hearts conduct their inevitable masquerade: a denial of life they present as window-dressing for public consumption — to be revealed utterly on that final and terrible Day of Reckoning. Glenn Fairman writes from Highland, Ca. He can be reached at arete5000@dslextreme.com and at http://www.stubbornthings.org and on Twitter.